Plots 4 and 2b are all planted up. The recent rains means that the crops are taking off, as are the weeds! 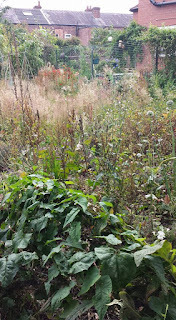 Plot 1b is slowly improving and now I feel that it is starting to resemble an allotment. Except, for a small area of the plot, 1b had not been 'dug' for probably 10 years so it has been a long process to try and get it under control. 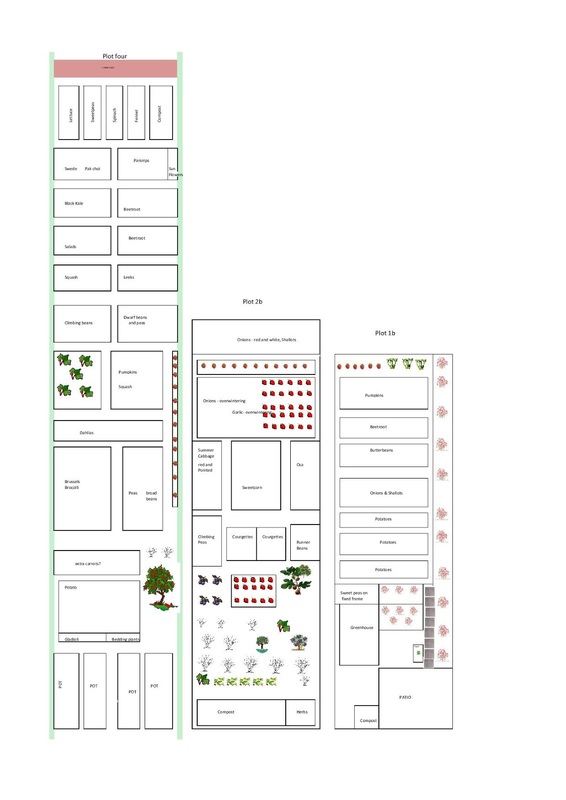 Upcoming plans for 1b including adding a seating area and putting up a fence made from pallets. We will also use slabs dug into the ground to try and prevent roots coming through from the area infront. It is looking like it will be a good year for fruit and we have also planted a good range of flowers for cutting. What progress was made in March 2016? 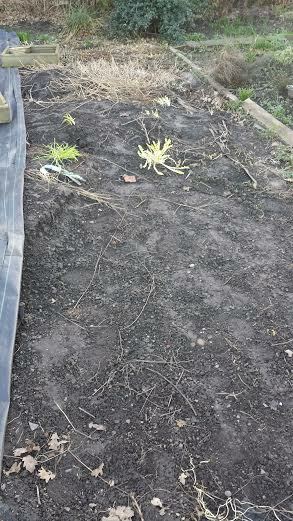 We have spent most of our allotment time clearing Plot 1b. We have made some good progress, although we do now have two 1 tonne builders bags full of couch grass roots! Am feeling confident we will have the whole of the plot sorted for planting this Spring; which is positive! 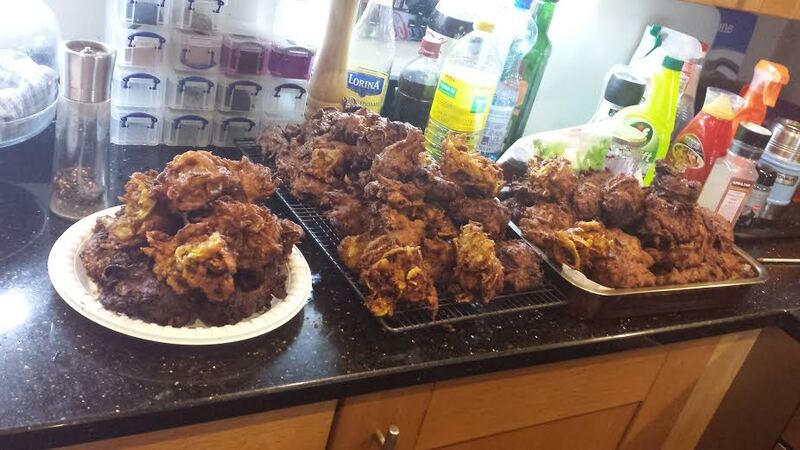 It's Easter weekend which means it is..... onion bhaji day! This has become one of those 'Spring jobs'. We buy our onion sets via the allotment ground sold by the weight. You can work out how many sets per 100g, but you need a few extras right? Every year I plan to cut down and end up with 100's and 100's. We do grow alot of onions; probably far too many, but they are easy to grow and low maintenance. At this time of year, I am starting to sow seeds in the greenhouse, but this becomes quite challenging when all your seed trays are filled with onions! 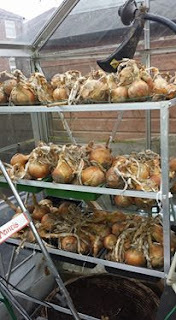 These are the onions destined to be bhajis which have been stored in our greenhouse over winter. 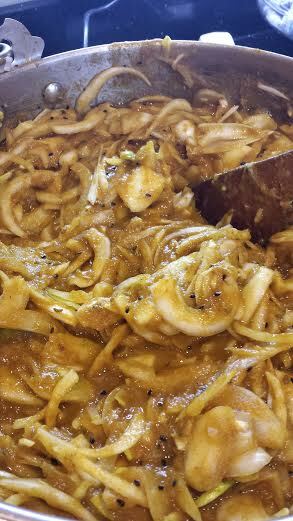 To make the bhajis you start with filling a large jam pan with onions. I chopped these up into halves or quarters depending on the size. I then filled the pan with water and left it to simmer until the onions were soft. Once soft, I used a blender to produce the puree to which I added the spices. I believe this is the secret to really tasty bhajis. 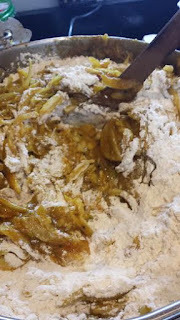 There are many ways to make the batter for bhajis, bhajis are just onions in batter afterall. This recipe uses plain flour, egg and water. 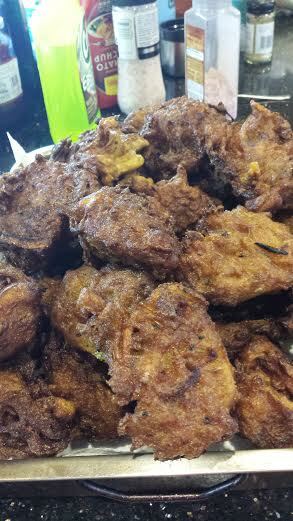 An article in the Guardian suggests that a 2:1 ratio of gram (chickpea) to rice flour should be used to make the "perfect bhaji" and discusses how different regions of India, traditionally, make bhaji batters of different consistencies producing varying textures of bhaji. I have tried a number of different methods and have found onion puree thickened with plain flour gives a great onion flavour. 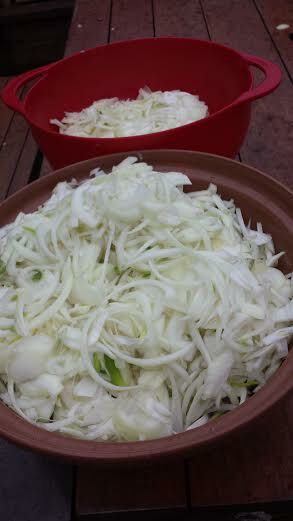 In addition to the spiced onion puree you need a large quantity of thinely sliced onions. I have found using a food processor saves your sanity a little here. 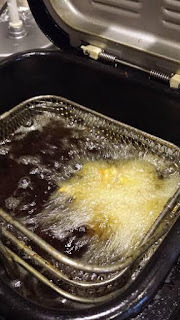 Deep fry a tablespoon full at a time in a flavourless oil (e.g sunflower) at 185 degrees Celcius until a deep golden colour. This is about 4-5 minutes. 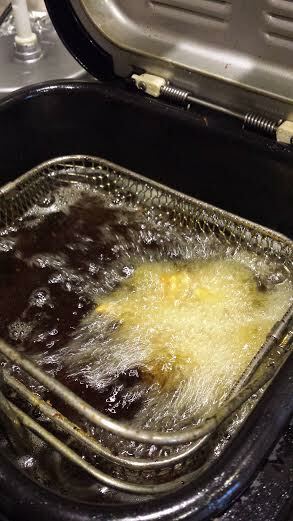 Our fryer is not very big and I can fit 4 spoonfuls at a time to produce 4 bhajis. If you cram too many in they will stick together. If this does happen, all is not lost as you can tease them apart and drop them back in the fryer for 30 seconds. This volume of mixture makes ALOT of bhajis; probably 100 at least. Only do this if you want to store them in the freezer. You can, however, reheat from frozen in the oven at 175 degrees Celcius for 15 minutes. You can cut down the volumes, by using a smaller pan for your puree and the same principles. Spices - equal quantities of black onion seeds, black sesame seeds, cumin seeds, paprika, cumin powder, garam massala, ground corriandor. (I add one heaped tablespoon of each). 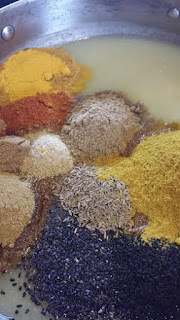 Nb: the spice mix is 1:2:5 ratio as listed above if you want to add more spices or make smaller batches. Add about half the onions roughly chopped to a large pan (e.g jam pan) and cover with water. Simmer until the onions are soft and blend to a puree. Allow to cool. Add the spices, seasoning and garlic to the puree. Use a food processor to slice the remaining onions. Mix the sliced onions with the puree and add plain flour until a dropping (cake mixture-like) texture is reached. This amount used the whole 1kg, but just add until you achieve the right texture. Deep fry tablespoons in the oil at 185 degrees C.
You will need a very large bowl, and alot of patience, to cook the whole batch so it may be easier to split the spiced puree and do this in two batches. You could freeze the puree to use another time. I would recommend frying the first bhaji and then tasting it. You can always add more seasoning/spices before cooking the rest if needed. In this case, just add these proportionally in the 1:2:5 ratio. e.g. If you wish to make a smaller batch - 5 large-ish onions and 1 tsps of the spices/seasoning (2 tsp of tumeric and 5tsps of the curry powder) will probably give you about 10-15 ish bhajis. This is about 2/3rds of the way through cooking this year's bhaji mountain! These will be heading into the freezer and used for our weekly 'curry night' with friends. The sun has not been out much in Manchester (yet), but there are some signs that Spring is coming. 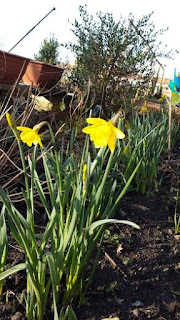 Daffodils are flowering and those annoying weed seeds are popping through in places. It has still been very wet, but we are lucky that our soil drains quickly and it doesn't become waterlogged. 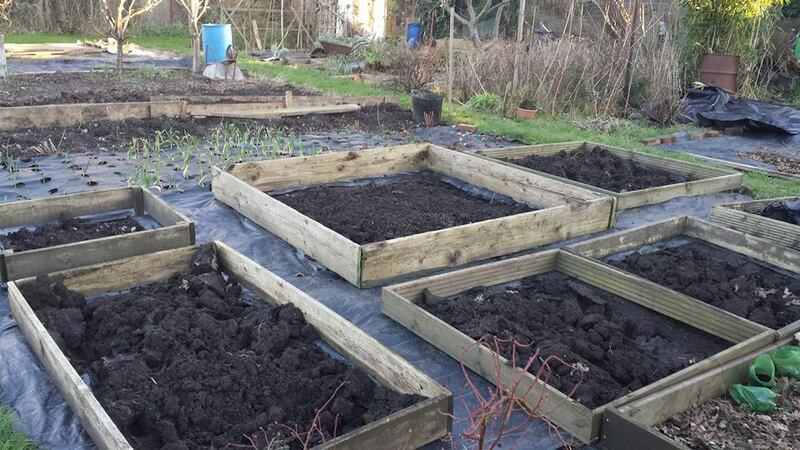 Despite the poor weather, we have made progress on Plot 2b and now have new raised beds in the middle section. 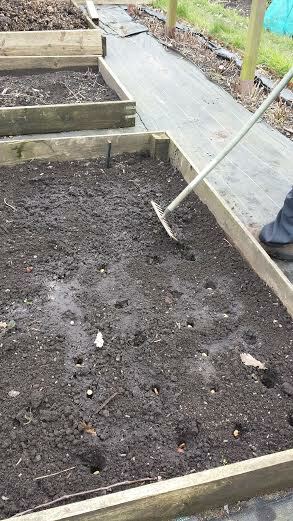 I have been itching to plant something so decided to put some broad beans in. These are pretty hardy so I think they will okay. We haven't planted broad beans for a while; probably because the crops can be so big we ended up getting a bit sick of them! In this section I have planted about 40 seeds in a block pattern. As these come through I will probably space them out a little so they are in double rows. At the end of last summer we decided to take on this half plot. It had been left unattended for a while, but it does have a nice greenhouse and patio area - so potential! This middle section was full of annual weeds, but really not too many of the real baddies. All the weeds had gone to seed so we 'blasted' them with a weed wand before cutting them down and covering the area with ground cover fabric over the winter. After uncovering this, I am pleasantly surprised; it doesn't look too bad! The plan is to work on clearing this area for planting in Spring. Last year I managed to just about stick to a planting plan, so this is 2016's effort. Happy Gardening All! 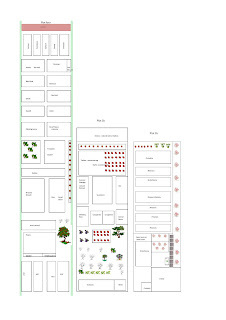 Click here for a larger version of the plan.